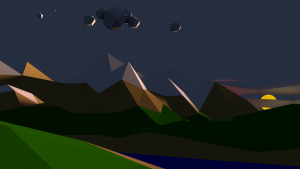 In the spirit of self-improvement and play, I’m going to try and do something new in Blender every day for 30 days. I’ll log my progress and failures here. I decided to embark on this adventure earlier today while bored on a bus from London. Today’s sketch is an experiment in low poly environments.